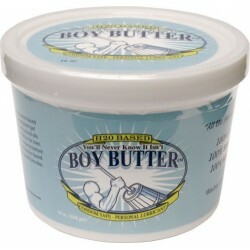 Boy Butter is a lube brand that only uses organic ingredients, taking extra care so that their products are gentle, totally edible, washable and safe on toys. 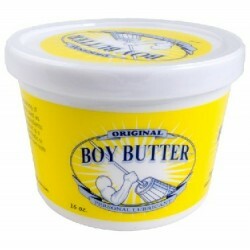 The packaging of this lubes really resemble the packages commonly used for ordinary butter. Amazing! A breakthrough in the world of lubes. Finally a water-based lube that’s thick and condom compatible. 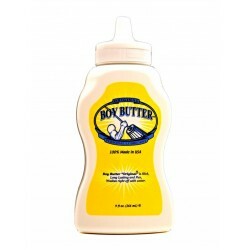 Unique and simply the BEST lube for condom users. 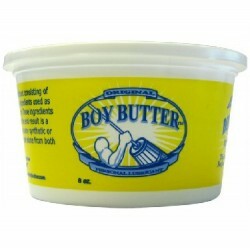 Original Boy Butter is entirely (vegetable) oil based making it as slippery as melted butter, letting you shove virtually anything up any hole with ease! It contains ingredients such as coconut oil and silicone for a soft slide effect. 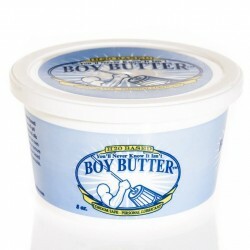 Try squeezing a little BOY BUTTER into your tight agenda today!BOY BUTTER is an organic coconut-oil based cream form lubricant that outlasts most oil and silicone based products while washing off with water alone.